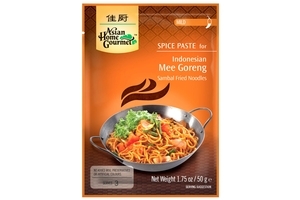 Asian Home Gourmet Indonesian Mee Goreng Seasoning - Sambal Stir Fry Noodles in 1.75oz (50g) sachet. Using Only High Quality Fresh Herbs & Spices and No Added MSG, Preservatives or Artificial Flavor. Sambal Is Important Part Of An Indonesian Meal. It Provides The Spicy, Exotic Flavouring To This Noodle Dish Or Mee Goreng As It Is Known In Indonesia. Vegetarian Society Certified. Halal Certified حلال . tomato paste, shallots, soyabean oil, salt, soya sauce, tarmarind, garlic, dried shrimp, sugar, cayenne, shrimppaste, red chilli.